In our first two lessons on Timothy we did a biographical sketch of his life and background to try to determine what made Paul pick him as one of his disciples. Although Timothy was an unlikely candidate to be a disciple because of his heritage and the surroundings he was brought up in, he nevertheless became not only a disciple of Paul, but one of the great pillars of the Christian faith. Once Timothy left his home and family in Lystra to follow Paul, what happened to him? Where did he go and what did he do in the succeeding years? The New Testament Scriptures give us some fascinating snapshots as to what life was like for this young man from nowhere as he followed his rabbi, Paul to the ends of the earth, making disciples in the name of his Messiah, Jesus. Immediately after leaving his hometown of Lystra and the province of Galatia in which he grew up, Timothy went with Paul to Macedonia and Achaia (Acts 17: 14-15 and Acts 18:5). From what we can tell from Scripture he was with Paul for all of his second missionary journey as they went on to Philippi, Thessalonica, Athens, Corinth, and Ephesus (Acts 17 and 18). When Paul took his third missionary journey, Timothy went with him as his aide. He stayed for most of the two and one half years that Paul was in Ephesus (Acts 19:22). Timothy then traveled again with Paul to Corinth, back to Macedonia, Philippi, and back to Asia Minor (Acts 20:1-6). When Paul was first imprisoned in Rome, Timothy was there as his friend (Philippians 1:1, Colossians 1:1, and Philemon 1:1). These epistles written to these cities were all penned while Paul was in prison in Rome. 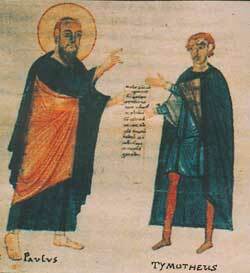 After Paul was released from prison, Timothy again traveled with Paul. At Paul’s request, he stayed in Ephesus to lead the church there (1 Timothy 1:3). Church tradition says Timothy later became the bishop of the church in Ephesus. I hope in the Lord Jesus to send Timothy to you soon, that I also may be cheered when I receive news about you. I have no one else like him, who will show genuine concern for your welfare. For everyone looks out for their own interests, not those of Jesus Christ. But you know that Timothy has proved himself, because as a son with his father he has served with me in the work of the gospel. Paul often calls him, “my beloved son” and “my true son in the faith”. Based on the above quote, Timothy was certainly Paul’s adopted son in the faith. At the end of his life Paul asks Timothy to join him in Rome (2 Timothy 4:9 and 2 Timothy 4:21) because he wants to see him before he dies. Like his rabbi, Timothy is also put into prison for his beliefs and his association with Paul (Hebrew 13:23). All this is not a bad resume for a backwoods boy from Lystra who was dealt a bad hand early in life. He was told that he was a “momzer”, an outcast, and that he had no chance to do anything in life. But, he had a belief in Jesus as the Messiah and God chose him to be one of his disciples. If God can use Timothy, he can use each one of us. We are all without excuse. All it takes is a fire in the chest and a willingness to try to be like our rabbi. One of the central figures of the New Testament story is Paul’s adopted son in the faith, Timothy. Two books of the New Testament canon were written by Paul to Timothy (1 & 2 Timothy) and he is mentioned in almost every other Pauline letter in some capacity. He is Paul’s most faithful companion and follows him all over Asia Minor, Greece, and even to Rome itself. Who is this young man who Paul called, “my true son in the faith” (1 Timothy 1:1) and “my dear son” (2 Timothy 1:1)? What do we know about him and what more can we learn by searching the scriptures and doing some historical research? In our first lesson, let’s look at Timothy’s hometown and his family background. Although we do not officially meet Timothy until the start of Paul’s second missionary journey in Acts 16, Paul and Barnabas visit Timothy’s hometown of Lystra on their first trip to Galatia in Acts 14. Paul and Barnabas were mistaken for Greek gods there (see “The Gods are Back”) and then later Paul was stoned and drug out of town and left for dead by an angry mob. Timothy would have certainly been present at these events and aware of this visit from these odd strangers in his hometown. A bit of background of the hometown environment that Timothy would have grown up in is very helpful in understanding what kind of person Timothy might have been. Lystra was a backwater town in the district of Lycaonia; essentially the middle of nowhere in Roman times. The word, ”Lycaonia” means ”wolf land” and gives an idea of the area’s remoteness. There were no main Roman roads in the area and it was basically out-of-your-way-to-anywhere in the province of Galatia. It was twenty miles on foot to the next decent sized town of Iconium (Acts 14:1-7). The people there were so “back woods” that they had never even adopted the universal Greek language as their common tongue. They still spoke their native Lycaonian dialect (Acts 14:11). In addition to the Lycaonians, from what we can tell from Scripture and other sources, the town also had a few retired Roman soldiers living there as well as a small Jewish population. In conclusion, Timothy would definitely have more been more comfortable in a rural setting than in the big city. In Acts 15:36, some two years after their first visit to Lystra, Paul suggests to Barnabas that they go back and check on the towns and people that they witnessed to on their first missionary trip. 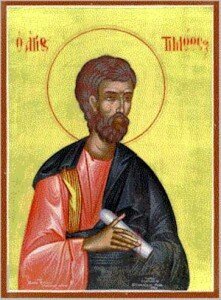 Paul, this time along with Silas, goes to Timothy’s home town at the beginning of his second missionary journey. We first meet Timothy by name in Acts 16:1-3, when, after arriving back in Lystra, the Text says that Paul wanted to take Timothy along on the missionary journey with them. As stated previously, Timothy was almost certainly present when Paul had come through two years earlier. He had witnessed the, “The Gods are Back” fiasco and had seen Paul stoned and left for dead and then get up and come back into his city again (Acts 14: 19-20). Most scholars think that he was probably 10-12 years old when Paul came through the first time and a young teenager when he came back two years later. It is only conjecture, but it is certainly probable that Paul had seen Timothy earlier and had his eye on this young man and his possibilities in the faith. What did Paul see? What was Timothy’s family like? What made him a candidate to be a disciple and Paul’s closest companion? 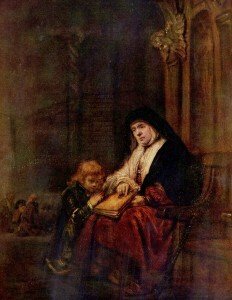 From Acts 16:1 we learn that Timothy had a strong Jewish background on his mother’s side. The text said that his mother was a “Jewess” and a “believer”. The word, “believer” means not only a follower of the Jewish God, YHVH, but also in his son, Yeshua. We can only assume that she became a believer in Messiah Jesus through the teaching of Paul and Barnabas – as that would have most likely been the first time that they would have heard the gospel story. We learn Timothy’s grandmother and mother’s name in 2 Timothy 1:5, Lois and Eunice. Although we do not know Timothy’s father’s name, we also learn in Acts 16:1 that his father was a “Greek”. The fact that the Bible says that he was a Greek and no faith was mentioned suggests that he was not a follower of YHVH or a believer in Messiah Jesus. As a twenty-first century reader, we don’t think anything of this “mixed marriage” between Timothy’s Jewish mother and his Greek father. But, as we will see in our next lesson, this fact is very significant and carried tremendous consequences for young Timothy.